Potential for large solar flares and CME's may be with us again soon | Watts Up With That? Readers may recall my reports on the CME’s from massive sunspot group 1429, seen below. It seems the sunspot group continues to live, and has unleashed another massive Coronal Mass Ejection. It will rotate into Earth view again soon. According to a forecast track prepared by analysts at the Goddard Space Weather Lab, the CME will hit two spacecraft, STEREO-B and Spitzer, on March 28th. Earth is not in the line of fire. This event shows that AR1429, the source of several strong geomagnetic storms in early March, is still active. It will begin turning back toward our planet about a week from now. Stay tuned. 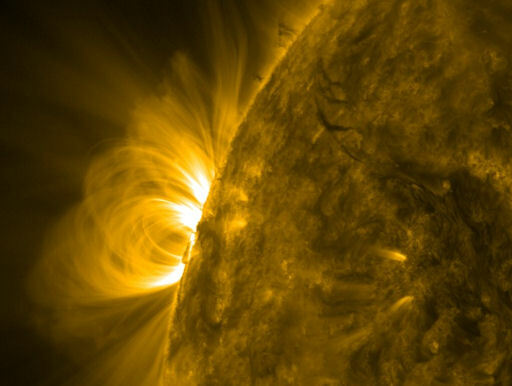 Earlier today, NASA’s Solar Dynamics Observatory photographed plumes of plasma rising and falling over the limb: movie. Moreover, a pair of solar flares (C5– and C7-class) in the sunspot’s towering magnetic canopy caused waves of ionization to ripple through the high atmosphere over Europe. These events suggest the region is still active. I really liked “RETURN OF THE SUNSPOT”, even if it was a bit hokey, but “THE SUNSPOT STRIKES BACK” will always be my favorite. Of course “A NEW SUNSPOT” will always have that endearing classical charm. I suggest NASA send a spaceship full of acne cream to the Sun? It could be paid for by a global sunspot tax. That’s really the second half of the saga. Right now I think we’re still on “The SUNSPOT MENACE,” and waiting for “ATTACK OF THE SUNSPOTS.” After that, we’ll still have to go through “REVENGE OF THE SUNSPOTS” before we get to your trilogy. 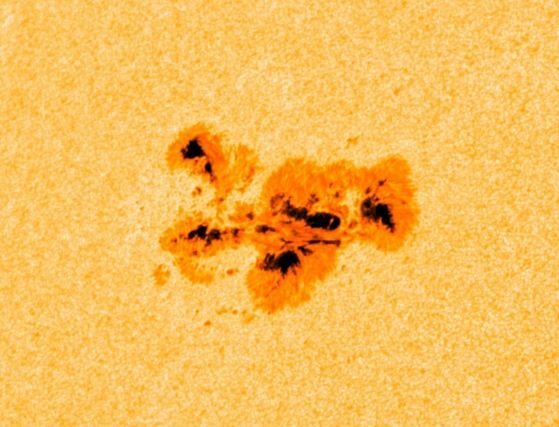 Massive sunspots don’t exist. Big (1000 MH), Super (1500 MH) and Giant (2500 MH) groups exist. Maximum size for 11429 was 1270 MH. So it wasn’t even a Super group. Sunspots and the CMEs may be temporary and distant, not well understood solar events, but according to this unique research they leave a permanent imprint on our precious and vulnerable planet. Full implications may not be of interest to the science or even known, but they might be far more important than it is currently thought of. CME’s spitting at us at 3.6 million miles an hour deserve our respect methinks ! Out of curiosity, how often do Carrington type CME’s occur without Earth taking a direct hit? Here in the UK we’ve just had a week of clear skies and the sort of warm weather we normally get in early summer ( if we’re lucky ). Does anyone have any opinion as to whether this might be due to a Forbush decrease caused by this sunspot group on its previous transition ? Does this say anything about Svensmark’s cosmic ray hypothesis ? Have there been similar unseasonal clear skies / warm weather on the other side of the pond ? What used to be common spot activity has now turned into a sideshow. Like going from sitcoms and their reruns to movie premiers once in awhile. I suppose the 2012 mantra and all the doom and gloom about death flares to society make these events more special now. But considering the electric/tech dependent society the globe is in now, these events would spark much more interest. Auroras are the neatest by-product of the solar activity. I feel sure it is down to the CO2 levels on earth! On the 27th we had just over 20C max, that is considered summer temperature over here. In 2012. 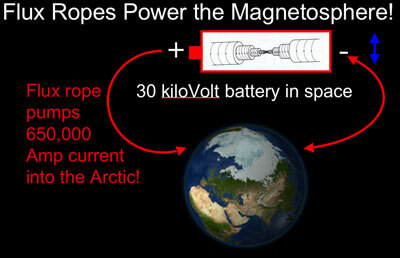 Can anyone say if repeated CME’s will weaken the magnetosphere? I truly believe something big is going to happen to earth and mankind this year.. There is a brief flash just as the X-radiation peaks and the plasma plume nears apex. The flash appears as “bright light” along 4 radiating lines from the Sun’s surface. Along each radiating line, a series of short bright line-segments appear, approximately at right angles to the radiating lines. Anybody know what these are? Is it a polarization phenomenon? I second that question – anyone who could point us to some info on that? The unseasonal weather In Europe is caused by a ‘blocking’ high pressure system that has formed rather later than previous winters. If it were two or three months previous, it would have meant very cold icy weather. Now it means relative warmth during the day and cold nights. In southern France, where I stayed last week, the region of Corbiere and Carcassone had just recovered from record cold and frozen rivers with spring no more advanced there than in UK. Th question is: what causes these normally eastward mobile polar highs to go stationary and block the Atlantic weather fronts? Standatd theory says theu divert the jetstream, but I think this unlikely and that the reverse is the case – something ‘up there’ directs things at lower altitude, and I think it has something to do with the solar flux. I doubt that Svensmark’s cloud mechansims play a major role….but suspect they are part of the picture. This pattern of blocking highs is probably what happened during the Maunder Minimum….leading to drastic impacts on crop production in Europe. Good question! Relative to the Carrington event CME, how big have they been seen, not just how often do they occur AND come at Earth? Then there would would be 1/18250 chances (1/365 X 50) per year of Earth getting hit with at least half of a Carrington. Sounds like CAGW-level threats. Better (worse) than lottery tickets, though. Let us enjoy them because in the next 20 years we´ll miss them. the CET long term warming is due to the warmer winters. I’m telling you, *SOMEONE* has it out for us. Lower odds than that, unless CME’s are restricted to the Earth’s orbital plane. A steer towards any evidence you may have for this belief would be good also. We witness a strong CME. Later we witness unusual warmth which returns to “normal” after a week or two. Australia gets some very high rainfall during your warmth – more than 4 inches in an hour on one day – weather phenomen now gone. I have no idea but is this coincidence ? It certainly is curious how slightly increasing levels of CO2 could cause this. CMEs spared as they move along, may be to a 20 or more degrees arc by time they reach the Earth’s orbit. Can anyone say if repeated CME’s will weaken the magnetosphere? but when both poles are taken into account since 1850’s the dipole lost more than 15% of its strength or 1%/decade. Weaker dipole, weaker magnetosphere, further more the field falls of with power of 3 with distance i.e. the field at 2R(R=earth’s radius) away will only be 1/8 as strong as the field at 1R away. On the plus side solar activity is falling off so we may possibly see some strengthening of the Earth’s field. solar activity is falling off so we may possibly see some strengthening of the Earth’s field. For the so manyth time: these two phenomena have nothing to do with each other. This is truly more interesting and meaningful then all the BS that is passing round. Ancient Earth may have been warmed by the presence of greenhouse gases, which made life possible on our planet, a new study, including Indian origin scientist, has suggested. “Because the sun was so much fainter back then, if the atmosphere was the same as it is today the Earth should have been frozen,” said lead author Sanjoy Som, a postdoctoral researcher at NASA’s Ames Research Center, Mountain View, Calif., who conducted the research as part of his UW doctoral work in Earth and space sciences. Will anyone, at any point, confirm, that all we can do is observe chaos in motion. And shows how the magnetic field outside the Earth is influenced ever so slightly by the sun. The main field of the Earth [the dipole that is decreasing by 1% per decade is generated deep in the core and is not influenced by the sun, the solar wind, CMEs, northern lights, batteries in space, etc. For aurorae observers worldwide the most disappointing thing about this sun spot group is that iti is synchronised with the full moon! > CME’s occur without Earth taking a direct hit? From the terrestrial frequency you could estimate the solar frequency of these events by scaling by the ratio of cross-sections: the effective celestial cross-section (flares probably are not uniformly distributed) by the effective cross-section of the earth. According to one theory the CMEs lead to changes in clouds due to electroscavenging. This leads to a warm-up that lasts 2-3 weeks after the event. If this turns out to be true it would be another way the Sun impacts our climate. Have we seen this (long lived, highly ‘active’ sunspot) before? There are likely not CME’s in the historical record, but how about descriptions (or sketches) of a long lived (multi-rotation) sunspot? Interesting that AR1429 is still intact. 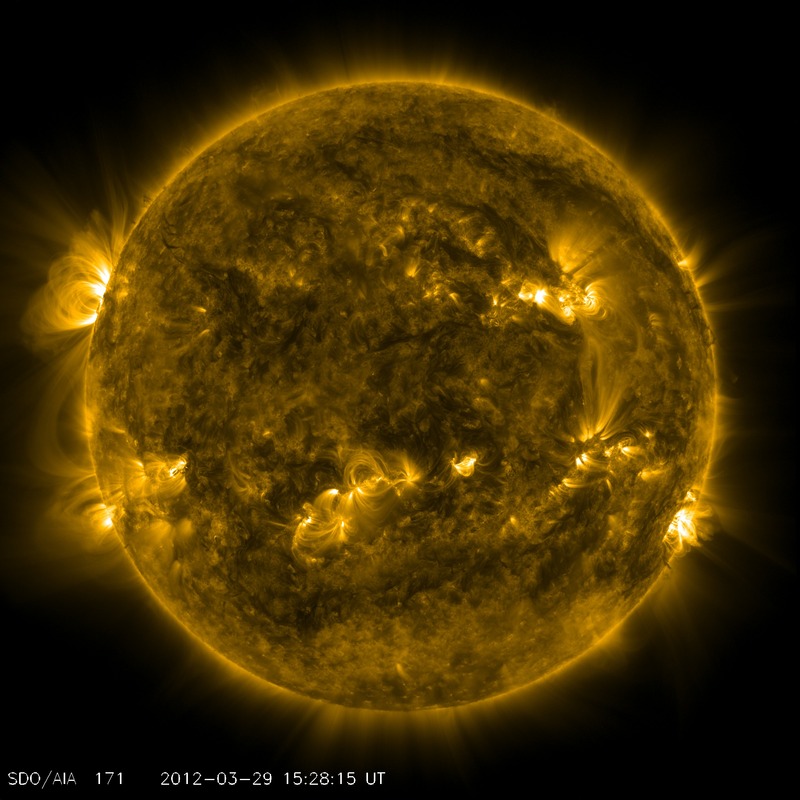 SDO and Stereo certainly help visibility to such. I have often wondered how our (country by country) electrical grid would do with another Carrington Event. You are both incorrect. The correct hypothesis must explain all of the observations. You started with a hypothesis and are defending a hypothesis. What I am stating is from published papers. I am basically just explaining what each of the authors stated. The only thing I have added is that there are four separated fields. Each author is a specialist in their field and is not familiar or interested in other fields. There is sufficient information and analysis from each field to pull together a complete hypothesis which is very significant in terms of explaining the anomalies in four separate specialties. If what is explained below is correct the planet will cool significantly (this is Dansgaard Oeschger cycle) and then sometime if solar magnetic cycle has occurred, there will be when the solar cycle restarts, a Heinrich event. The recent rapid geomagnetic field (late twentieth century, the Southern Atlantic anomaly is now roughly 30% weaker than the geomagnetic field. The change in the field is accelerating. A planned European set of satellites will be launched this April to study the rapid reduction in the Southern Atlantic geomagnetic field). Both solar heliosphere changes and the geomagnetic field changes modulate the intensity of GCR that strikes the earth and amount of cloud forming ions. If the past cyclic geomagnetic field did occur, they occurred a physical reason. The sun if it is the cause is capable of a massive discharge. (As there is no geological phenomena that is capable of changing the geomagnetic field. A geomagnetic field change is capable of abruptly cooling the planet for a 1000 years.) Think of the amount of energy that is require to abruptly change the geomagnetic field. Re-look at the solar observations. What happens to massive objects when they collapse is a fundamental component in explaining a host of astronomical anomalies such as the rotational anomaly of spiral galaxies as well the very existence of spiral galaxies as compared to elliptical galaxies. The orbital cycles of the planets influence the sun as the sun changes with time. There is a charge change. The planets take time to equalize to the change. There is a lag. There is a gradual change in solar charge with time as the cycle progresses which explains phenomena that is dependent on the length of the solar cycle. Follow the interruption of the solar magnetic cycle there are abrupt very large charge discharges. The interruption of the sun spot mechanism, stops the solar equalization mechanism which then allows the solar charge in balance to build up. The similarities of NS and GBHC properties, particularly in low and quiescent states, have been previously noted, [e.g. van der Klis 1994, Tanaka & Shibazaki 1996]. Jets and their synchrotron emissions in NS, GBHC and AGN also have obvious magnetic signatures. It is axiomatic that astrophysical objects of stellar mass and beyond have magnetic moments if they are not black holes, but an intrinsic magnetic moment is not a permissible attribute of a black hole. Yet in earlier work, [Robertson & Leiter 2002] we presented evidence for the existence of intrinsic magnetic moments of ∼ 1029−30 gauss m^3 in the galactic black hole candidates (GBHC) of low mass x-ray binary (LMXB). Others have reported evidence for strong magnetic fields in GBHC. A field in excess of 10^8 G has been found at the base of the jets of GRS 1915+105 [Gliozzi, Bodo & Ghisellini 1999, Vadawale, Rao & Chakrabarti 2001]. A recent study of optical polarization of Cygnus X-1 in its low state [Gnedin et al. 2003] has found aslow GBHC spin and a magnetic field of ∼ 10^8 gauss at the location of its optical emission. These field strengths exceed disk plasma equipartition levels, but given the r^−3 dependence of field strength on magnetic moment, the implied magnetic moments are in very good agreement with those we report in Table 1. Although there are widely studied models for generating magnetic fields in accretion disks, they can produce equipartition fields at best [Livio, Ogilvie & Pringle 1999], and perhaps at the expense of being too luminous [Bisnovatyi-Kogan & Lovelace 2000] in quiescence and in any case, too weak and comoving in accretion disks to drive jets. While tangled magnetic fields in accretion disks are very likely responsible for their large viscosity, [e.g. Hawley, Balbus & Winters 1999] the highly variable mass accretion rates in LMXB make it unlikely that disk dynamos could produce the stability of fields needed to account for either spectral state switches or quiescent spin-down luminosities. Both require magnetic fields co-rotating with the central object. Further, if disk dynamos produced the much larger apparent magnetic moments of GBHC, they should produce them also for the NS systems and cause profound qualitative spectral and timing differences from GBHC due to interactions with the intrinsic NS magnetic moments. This latter discovery was revealed in the following manner: a) First it was argued (Robertson and Leiter, 2002) that the spectral state switch and quiescent luminosities of low mass x-ray binaries, (LMXB) including GBHC, can be well explained by a magnetic propeller effect that requires an intrinsically magnetized central object. b) Second it was shown (Leiter and Robertson, 2003; Robertson and Leiter, 2003) that this result was consistent with the existence of a new class of gravitationally collapsing solutions of the Einstein field equations in General Relativity which describe highly red shifted, magnetospheric, Eternally Collapsing Objects (MECO) that do not have trapped surfaces leading to event horizons. These general relativistic MECO solutions were shown to emerge from the physical requirement that the structure and radiation transfer properties of the energy-momentum tensor on the right hand side of the Einstein field equations for a collapsing object must contain equipartition magnetic fields that generate a highly redshifted Eddington limited secular collapse process which satisfies the Strong Principle of Equivalence (SPE) requirement of time like world line completeness. The cause of the long-term variability in quasars is still a matter of debate. Unlike the short-timescale variations (on the order of days), which are adequately described in terms of relativistic beaming effects (e.g., Bregman et al. 1990; Fan & Lin 2000; Vagnetti et al. 2003), the variations at much longer timescales (years to decades) are less well understood. Current scenarios under consideration range from source intrinsic variations due to active galactic nucleus (AGN) accretion disk instabilities (DIs; e.g., Shakura & Sunyaev 1976; Rees 1984; Siemiginowska & Elvis 1997; Kawaguchi et al. 1998; Starling et al. 2004) and possible bursts of supernovae events close to the nucleus (e.g., Terlevich et al. 1992; Cid Fernandes et al. 1996), to source extrinsic variations due to microlensing events along the line of sight to the quasar (e.g., Hawkins 1993, 2002; Alexander 1995; Yonehara et al. 1999; Zackrisson et al. 2003). See also the review article by Ulrich et al. (1997). Determining which of the various proposed mechanisms actually dominates quasar variability is best done by studying it toward the longest possible time baselines. Depending on the mechanism, each has markedly different variability “power” at the longer timescales (e.g., Hawkins 2002). This means that if one has a quasar monitoring sample that is both large enough and covers a large enough time baseline, one could address these issues adequately. Unfortunately, given the nature of monitoring programs, this is not something that can be started overnight. The longest quasar light-curve monitoring programs are on the order of 20 yr (e.g., Hawkins 1996) and will take a long time before they are expanded significantly in time baseline. Your ideas about quasars are, of course, interesting, but have, unfortunately no relevance to solar or terrestrial magnetism. Both of which are generated in the interior of each body by dynamo action. The solar magnetic field is brought out into interplanetary space by a solar ‘wind’ [expansion of the hot solar atmosphere] and when it meets the Earth’s magnetic field, the solar field has fallen to 1/10,000 of the Earth’s field. The interaction between the two fields generates electric currents near the surface of the Earth with their own magnetic fields, which are a small fraction of the Earth’s field [at most a few per cent in very rare cases]. The decline of the Earth’s magnetic field is due to shifting movements of material in the core of the Earth and not controlled by the Sun. Looks like the return of 1429 may be a “damp squib”. Solar watchers have been following the return of Sunspot 1429 with anticipation due to the high level of activity while transiting the farside of the Sun. A couple of C-Class flares (C7.7 and C5.0) were detected early Thursday morning, however things have been fairly quiet since. 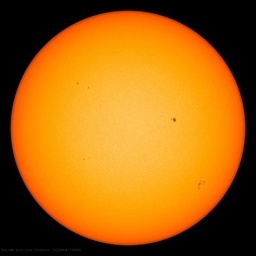 This region continues to rotate further into view and no major sunspots are visible as of yet. We will see the remainder of this region by late Friday, however it appears that 1429 is in a state of decay. From a magnetic standpoint, what is left of 1429 may still be able to produce an isolated M-Class flare. If I am to understand that paper, cloud formation is enhanced by the activity? That made me a bit curious so I went and pulled down some Modis data for the period of the CME on the 7th. Doing a surface plot of the data and then taking the global average day by day yields an interesting bump in the overall cloud cover. Dunno if it means anything. Some one more skilled might want to take a look at it. I am only going by what the data shows. It is not the solar wind that has the long term or permanent effect on the Earth’s magnetic field. Solar wind is far too weak, and I did not either said or suggested so. It is the solar storms caused by the CMEs that appear to be the cause, which at their max are 0.5-1% of the Earth’s field strength. It is clear from the data that effect is more permanent than few days or due to the seasonal change in the inclination of the Earth’s axis (as Dr. S. suggested in the past). In science the data should have more veracity than any opinion. The effect can be observed only in the North Hemisphere, possibly due to bifurcation of the Earth’s field (see map inset in the above link), creating a double ‘North’ pole, while historical data show that the effect is not observable in the South H with a single magnetic pole. If the above is correct than theory of the Earth’s dipole may need revising. As far as the long term temperature records are concerned the ‘apparent’ N.H correlation to the geomagnetic field is indeed the strongest in the Arctic. Longer term data from the North Atlantic basin do indicate that the fundamental (but indirect) solar activity – temperature changes relationship is evident. Your extensive post (treatise) may be very relevant, but I am not in position to comment since the clear understanding is required of what is suggested there. Is it possible for someone to comprehend what is going on now, at the tip of Norway without understanding the distant quasars, secondary stars and black holes, I think is a matter for an individual’s judgment. It is not the solar wind that has the long term or permanent effect on the Earth’s magnetic field. Solar wind is far too weak, and I did not either said or suggested so. The CME’s are but minor fluctuations in the solar wind. They cause a temporary increase of the ring current, which soon relaxes back to normal and have no influence on the main dipole field of the Earth. What we observe is a superposition of the main [interior] field and the exterior field of the ring current. The secular decrease of the core field has nothing to do and is not related to and is not caused by anything solar. Your ideas about quasars are, of course, interesting, but have, unfortunately no relevance to solar or terrestrial magnetism. Sir, for politely declining to stray, ahem, off topic, you have my deepest respect. What are the dates that the spots will be in position for a likely earth impact if there is a CME? There will be some C class flares and possibly some low-level M-class flares, but you aren’t going to see anything like we did the last go-round. John Day notes the “literature” suggests once per 500 years a CME hits Earth. Unless a CME litters the orbital path of Eath for a 12 month period, the actual events must be very common. It could be that the nitrate data overestimates the level of a CME, but if a Carrington Event is the killer the namesake was, and it only happens for a few days and then goes away, then a Carrington Event per se must be very common for a 1 in 500 year record, say (for a 2 day “strike” time), one ever 18 months (two days in orbital period takes 500 years to be in the wrong place at the wrong time). I’m betting the nitrates data recognizes something much, much less than a Carrington. Why is that limb of the Sun called the North East limb, it looks like the North West limb to me Are Seattle and California now to be found on the East of the USA ? Or is there some explanation for this apparent confusion ? No. It conforms with projection methods for the sun-spot count. We’re talking about the 3rd picture down, the dark yellow picture. That’s the top left which is shown and therefore the North West limb, surely. Either that or North West South East are determined from the side of the sun opposite to planet Earth. Or the guy at NASA who labelled it the North East limb has an Australian’s view of geography. OK. Thank you for that explanation. I suppose it is reasonable that NASA might be able to tell left from right and East from West, even if they do struggle somewhat with predictions. eg. sunspot numbers. How many “Carrington events”, have been identified lately. Probability just lost me the mega-millions jackpot, now percentages matter again ? By virtue of their rarity, extreme space weather events, such as the Carrington event of 1859, are difficult to study, their rates of occurrence are difficult to estimate, and prediction of a specific future event is virtually impossible. Additionally, events may be extreme relative to one parameter but normal relative to others. In this study, we analyze several measures of the severity of space weather events (flare intensity, coronal mass ejection speeds, Dst, and >30 MeV proton fluences as inferred from nitrate records) to estimate the probability of occurrence of extreme events. By showing that the frequency of occurrence scales as an inverse power of the severity of the event, and assuming that this relationship holds at higher magnitudes, we are able to estimate the probability that an event larger than some criteria will occur within a certain interval of time in the future. For example, the probability of another Carrington event (based on Dst < −850 nT) occurring within the next decade is ∼12%. We also identify and address several limitations with this approach. In particular, we assume time stationarity, and thus, the effects of long-term space climate change are not considered. While this technique cannot be used to predict specific events, it may ultimately be useful for probabilistic forecasting. It seemed pretty obvious to me from the heliocentric configurations in early March 2012 that there would be a peak in flare activities around the 5-7th March. 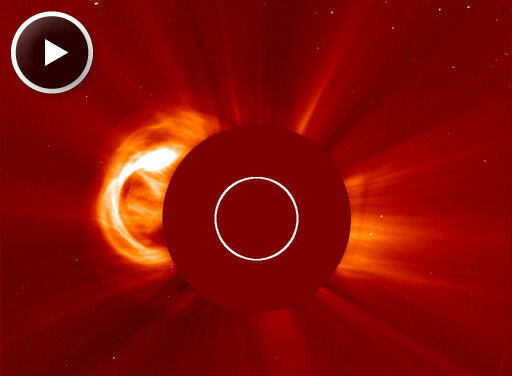 This is pretty interesting, do you think these solar flares affected weather patterns? Where I am from (Southern Alberta, Canada) it went from -8C to over 18C in a span of a few days when these solar flares hit.